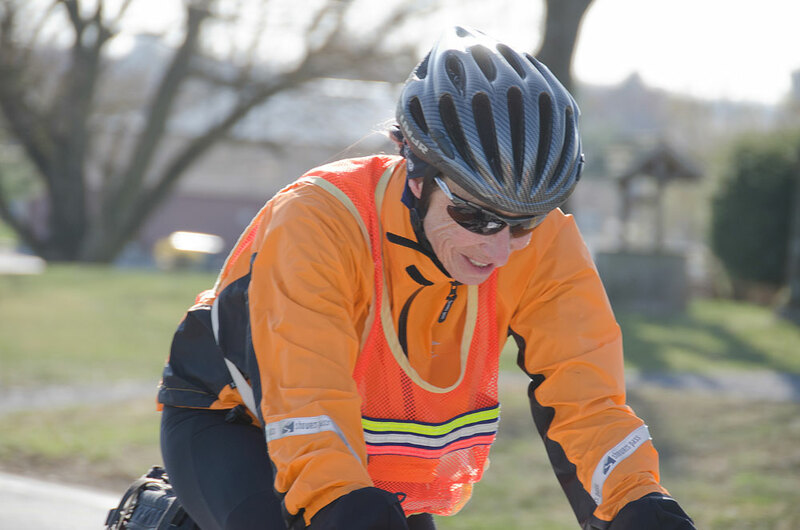 Lynn’s involvement in the cycling community had a broad reach – Babes on Bikes, the DC Randonneurs, the Potomac Pedalers, and her most recent creation, our group, the eBabes. The E is for early mornings, and what early mornings they were! 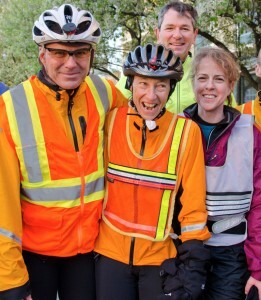 Late in the spring of 2008, Lynn sent out a ride announcement declaring her intention to ride at 5:30 a.m. and just hoping someone would join her. A few of us actually did, much to Lynn’s delight, and then we met again, and again, and again. Lynn was strong and inspiring, a natural leader. She was direct, challenging, and prompt…but also caring, funny, and affectionate. And so we kept coming back for more. Lynn was a treasured friend and mentor who believed in us – even when we didn’t believe in ourselves. No matter how tough the climb, how many miles we had left to ride, how much wind was in our face – she believed we could do it. So we did! Every ride with Lynn was a learning experience. Some of us learned the Latin names of the indigenous plants that Lynn pointed out as we huffed and puffed up the hills. And we learned that you don’t need a flashy kit, carbon frame, or aerodynamic helmet to cruise up those steep hills….and if you happen to see someone (especially a man) on a carbon frame, with a flashy kit and a funny looking helmet, it’s nice to say hello when you pass him. We learned that if you got a flat tire while riding with Lynn, it’s proper etiquette to remove your gloves, as if you were going to change it yourself….then wait for Lynn to say “Move over, I’ll do it” and then breathe a sigh of relief. 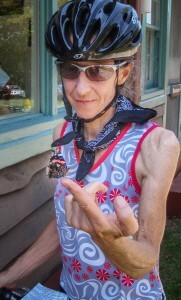 Once we got to know Lynn, we learned that what she called a “flat, easy ride” was neither. Finally, we learned that it’s actually possible to stop at a gas station, remove a layer of clothing, use the bathroom, buy a drink, explain to the cashier where you’re riding to, reassure the cashier that you can actually ride that far, drink your drink, and be ready to roll out all within 5 minutes. 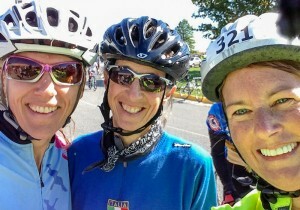 Being prompt and efficient was part of being successful on rides, and Lynn helped us master those traits. There was a level of trust with Lynn that was special and unmatched. She took care of us on rides – helped us when we needed it, came back and got us when we fell behind, waited at the tops of hills, allowed us to draft off her for hours (!) and left the unflattering parts of a ride out of the ride reports. Lynn always knew where she was going, which was good, because *some* of us could not find our way out of a parking lot! She was a human GPS, and we’d follow her directions over a Garmin’s any day. from being stronger than you thought you were. And in pulling us together, she planted the seeds of a special friendship that has blossomed among us. We talk about real stuff, on the bike and off. We count on each other for support, advice, and perspective. And sometimes, just to be there when we’re not feeling so strong. Lynn was our fearless leader and we are eternally grateful for all that she gave us. Thank you, Lynn. You did so well. We are proud of you. What a babe.